I love my perfumes, but I am always sooo choosey and I find it really difficult to find a new scent that I love. I like mild florals and sweet smells, which narrows many perfumes down. Usually I only buy a perfume if it's super cheap to try, but will otherwise stick to the scents I know. Over the years I've come to affiliate certain smells of perfumes/colognes with different times or people. For example, The Body Shop's White Musk scent reminds me of my grandmother, and Davidoff's Cool Water reminds me of my ex. Mariah Carey's perfume (which I can't remember the exact name of, but it came in a round jewel encrusted bottle and was super sweet) reminds me of my best friend from year 9, and Joop reminds me of my current boyfriend. Smell to me is just one big mental reunion. My all-time favourite perfumes from over time have to be Britney Spears' Curious, Sarah Jessica Parker's Covet, and Marc Jacobs Daisy which is a new-found love. Covet is such a lovely sweet floral scent, perfect for spring or autumn, and Daisy is quite similar, though I have gotten into a little habit of mixing two perfumes together, which I'll explain later. So, in this collection, we have Beyonce's Heat Rush, Marc Jacob's Daisy, J. 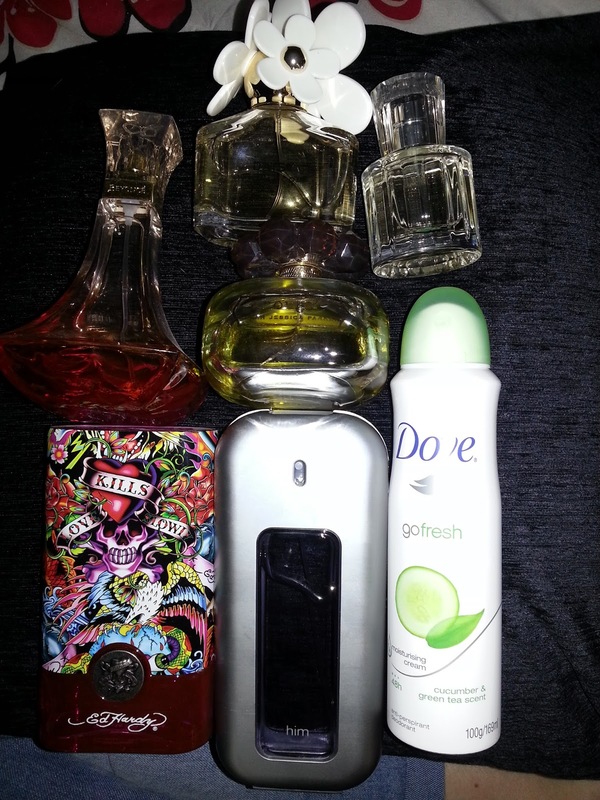 Lo's Glow, Sarah Jessica Parker's Covet, Ed Hardy's Love Kills Slowly, FCUK's for Him, and Dove go fresh cucumber and green tea scent deodorant. Heat Rush and Love Kills Slowly are both sweet smells, Heat Rush is a more spicey sweet, whereas LKS is a lolly sweet smell. Covet and Daisy are both florals, covet being really light, sweet and smooth, the perfect scent for a sunny spring day, and daisy being more tangy sweet, perfect for a dinner out. Glow is a mix. So so perfect though. It is a sweet floral vanilla smell. One of those I-could-just-inhale-this-all-day smells. YES I am aware that I have a men's cologne. Oopsidaisy. What happened was, I got a little too excited at the Beauty Spot counter and accidentally thought I was buying a women's perfume, but I was not. It was $10, which is cheap as chips, so I'm not disappointed. It smells delightful and lasts ages, but yes, it is a manly sweet smell. So what I do with that one is I spray two squirts of the FCUK and then spray two squirts of the Ed Hardy perfume of the top, and mixed together they smell delightful. I usually wear that just for when I go to work, as the store gets quite hot, and I won't need to worry about smelling terrible for my whole shift. As for my deodorant, its just a plain boring supermarket/drugstore brand, but it smells nice and fresh and is good by itself if you're just going grocery shopping or to the gym, just to keep from smelling all sweaty and gross. Every one of these perfumes is perfectly affordable, though Daisy IS a bit on the pricey side which is poopy, but it's definitely a lovely smell. It can be found for around $70 on sale, but can be up into the hundreds when it isn't. The others (apart from Ed Hardy because it was a present so I have NO IDEA how much that was), are under $40. Perfect perfumes for any occassion! 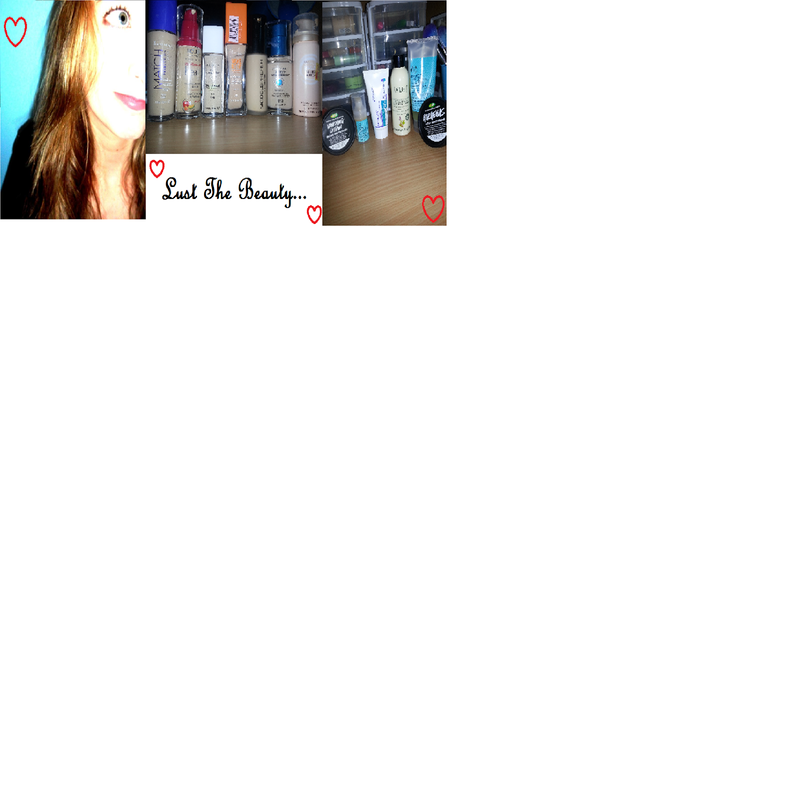 Next time I will be going through all my face stuff: foundation, concealers, powders, bronzers, blushers. So stay posted for that! Going to try the Marc Jacobs one for sure!